It' January.... It's kind of frickin cold. It was -15 F this AM but its usually not THAT cold. 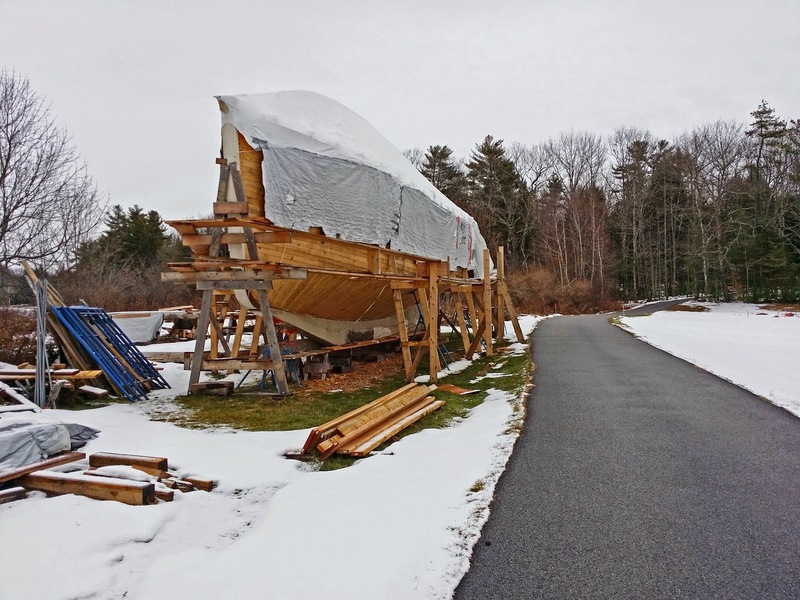 The boat was shrink wrapped for the winter and some lumber tarps were hung off the sides to help keep run off from dribbling down the side of the project all Winter and Spring. Though there is plenty to do, I am taking a little time during the winter to collect my thoughts, think about interior design, systems and getting priorities straight for the next construction season. I hired Chip F. to help me get things jump started last Summer and Chip didn't disappoint. We got a lot done and there's a boat load of stuff to do in 2015 too. 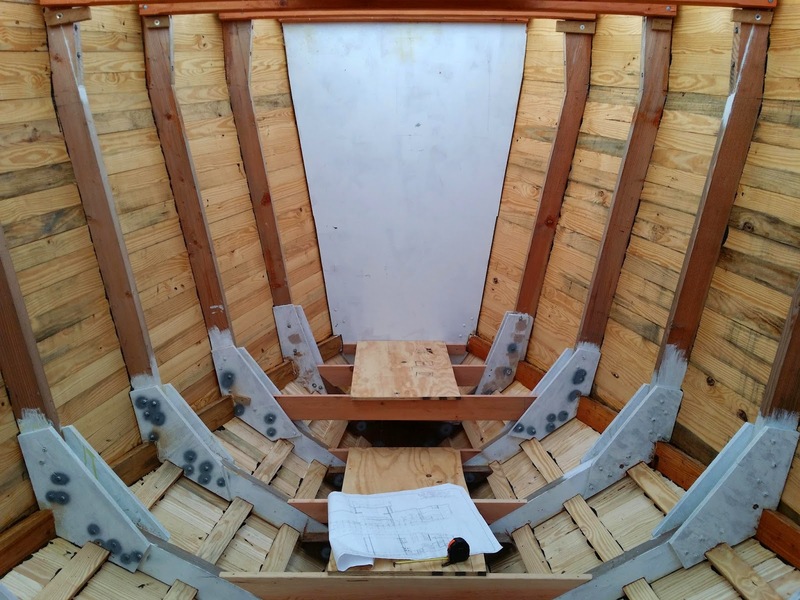 My goals for this year are to get two layers of 1/2" ply on the hull over the planking, 3 layers of 1/2" ply on the deck, coat the hull and deck and move the project to Yarmouth this Summer to put the pilot house on. I can't put the pilot house on in Falmouth because the project won't fit under the utility wires between here and the water with the pilot house on. Any other significant interior bulkheads will need to be addressed now too as once the deck goes on getting big anything into the ship is problematic. I have started sketching the interior lay out for Pile of Wood and find that I have lots of great ideas on paper but when I get the plans down to the interior (2nd picture) I find I have to scratch out about 30% of what I draw to get it to actually fit the stuff that looked so good when I drew it up at the house. I also have had to do a lot of window shopping for systems as the physical implications for the interior build out are driven by what I put in the boat from water tanks to anchor lockers. This has led to a lot of New Year's anxiety as I slowly tally the "tab" for all this stuff. On the one hand its kind of exciting and fun. It also is very sobering and has had me really rethink my strategy around what "I need". On the one hand, this will be my home and I don't want to feel like I am camping each and every day. I want my beer cold, a real stove and a few other modest trappings of civilized life. But I don't need a lot and finding that balance around what's really important and what isn't is definitely part of this journey. I almost pooped my pants when I realized that a good windlass and anchoring stuff could run me well over $10K. That's just stuff to anchor. Yikes. I'm both excited and mortified. Its all good, but this window shopping stuff has my heart skipping a few beats now and then. Though there is still so much to do, its really important to have this natural break in the cycle to get focused and set yourself up for good decisions that will be the underpinnings for next year's construction. I found I needed this break to think things through, and I am!